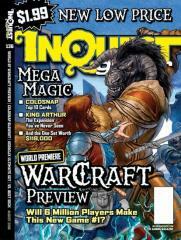 #136 "Top 10 Coldsnap Cards, Warcraft Preview"
-An exclusive preview of Upper Deck's upcoming World of Warcraft TCG. Get the skinny on play, "loot" cards and "raid decks" and how the card game can affect your online characters! -The most dangerous decks, strategy and more for Magic's new Coldsnap set nearly two weeks before it hits shelves! Pick up this issue or prepare to be freezer burned! -Another long-lost Magic set? Was Arthurian Knights the supposed follow-up to Arabian Nights? All the unrevealed details can be found in IQ #136! -The best HeroClix figures on the planet. Period. We assembled our dream team of the greatest figs WizKids has ever produced into the ultimate set all fans want to see!